The hit television series Mad Men, which returns to screens on AMC on Sunday April 7 for the final season’s final episodes, has spawned a huge interest in hairstyles from the era. Its popularity is not just about the well-written, gripping storylines. The attention to retro detail and the classic style of Don Draper and his crew is at least an equal attraction. Well-tailored grey suits, pocket squares, and skinny ties makes the men on the show look cool, sophisticated and utterly manly. They even look modern, in their own way, which says something about a show set in the swinging sixties. 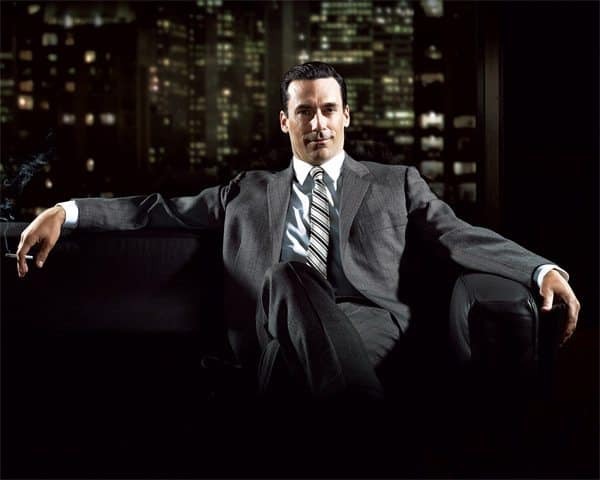 The 1960s were all about slicked-backed styling for guys, and Donald Draper — the ad man at the center of the series — sports a clean-cut hairstyle is a statement in itself – alpha, success and professionalism. Don Draper and the other men at the advertising agency in the series sport haircuts that demand they be taken seriously. Your grandpa probably did his hair the same way: tight on the sides with a sharp part on the left side of the head. And of course, the hair needs that healthy looking shine. To help upgrade your hairstyle to something more respectable and Mad Men-esque, we offer the following tips from the Emmy Award-winning hairstylist of Mad Men, Gloria Ponce, who uses American Crew hair products on the Mad Men set. [italics] shine without making your hair as hard as a helmet. To get the Don Draper look, ask your hair stylist or barber to cut your hair tight and tapered on the sides, and leave it long and full on the top. Tell the barber that you also want your part on the left side of your head. A good barber can cut the hair in a way that will help the hair part more easily and naturally. To style like Draper, use a hair product such as American Crew Pomade and run it through the hair while it is still damp. Take a comb and create a part on the left side of the head. Create a small wave on the front of the hair by combing up the front and then back towards the right, then comb back the sides of the hair. Instant Draper. For more Mad Men-inspired looks, such as Pete Campbell or Sterling Cooper (our favorite silver fox here at 18|8! ), come and see the team at your local 18|8 salon. We may not be mad men ourselves — but we are mad about hair styling, and mad good at making you look like a winner from Madison Avenue in the 1960s!